Compact plant is covered with small, deep blue flowers. Blossoms early and continue throughout the summer. Desirable for edging and rock gardens. 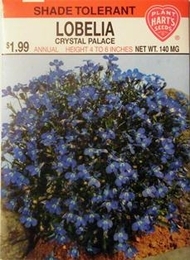 Lobelia will tolerate moderate shade but will thrive in light shade or full sun. Fertilize after first bloom and keep well watered.